I've been cooking and posting cookie after cookie for this challenge. Some are completely homemade. Some are not. Why? Because we all have a different definition of what home-baked is. I know my definition has changed drastically over the years. Killer brownies came about because we LOVE brownies from a particular brand's box mix and I've never found a recipe that we think is better. If you have a wonderful brownie recipe from scratch, please use it! Same goes for the frosting. And if you want to make homemade Heath Bars and peppermint patties, will you be my best friend? LOL! 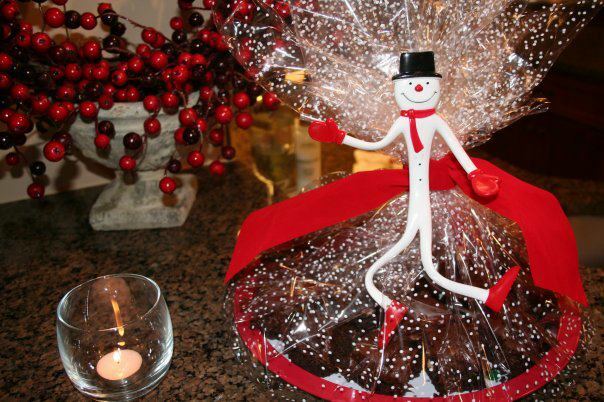 This is more a post about ideas to enhance your brownies and make them a little more festive for the holiday season. 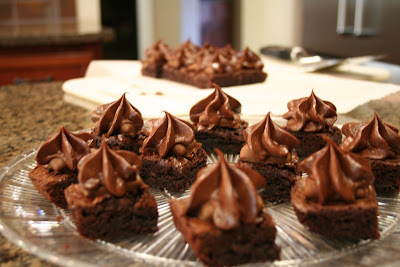 I've made these brownies and given them away by the holiday-decorated plateful during several Christmas seasons. They're always a hit! Make the brownies according to the package instructions and omit the fudge sauce. You can use any of Ghiradelli's brownie mixes and I'm sure they'll taste just as delicious. When the brownies come out of the oven, place the unwrapped candies on top of the brownies, lining them up in straight lines and leaving enough room to cut through the brownies without having to cut through the candies, one candy per brownie. Let the brownies cool completely. You can frost the brownies, then cut them and serve OR cut the brownies and use a star tip or other decorative icing tip and decorate your brownies. Either way, they will taste great!